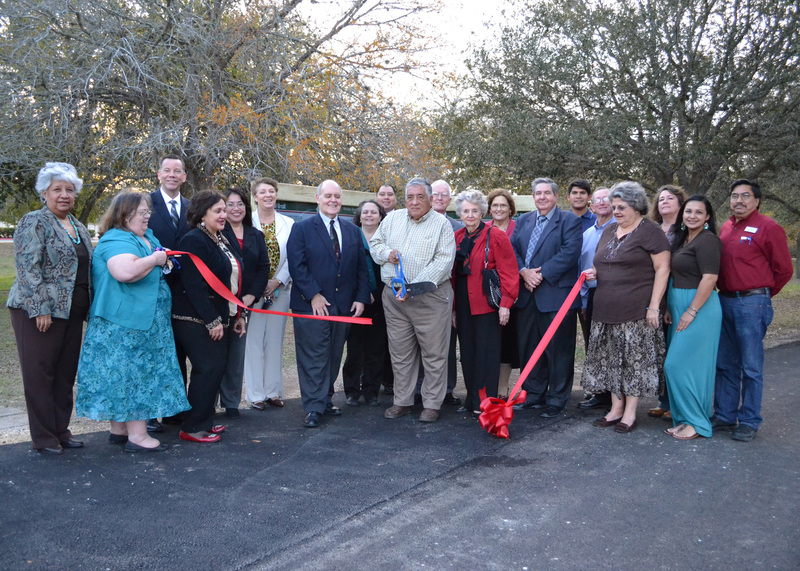 CBC Board of Trustees and staff, from left, are Gloria Rincon, Ruth Cude, Dr. Bruce Exstrom, Glenda Garza, Velma Elizalde, Laura Fischer, Dr. Thomas Baynum, Dr. Patty Candia, Victor Gomez, Paul Jaure, Dr. Jimmy Goodson, Louise Hall, Donna Atkins, Doug Arnold, J. Estevan Vasquez, Carroll Lohse, Glynis Holm Strause; Joy Burkhardt of KRXB, Isabel Ramirez of Beeville Chamber of Commerce and Jesse Mendoza of Park-Breidenbach Real Estate cut the ribbon for the official opening of the walking trail at Coastal Bend College in Beeville. The trail features. Work on the 1.5-mile track is not quite completed, but the trail is open to the community. The $182,000 project, approved by the Board of Trustees last August, included regrading, resurfacing and hydromulching the track.The trail was installed in December 1986, according to college records.